Monday marks the sixth day of anti-government protests in Sudan. The protests started over the rising costs of bread and fuel, but have since widened to call for the overthrow of President Omar al-Bashir. In less than a week, the demonstrations which began on December 19 in the city of Atbara quickly spread across the country, including to the capital Khartoum. In some cities, security forces have used tear gas on protesters and witnesses report the use of batons and live ammunition by riot police. Protesters have attempted to storm official building and set fire to tyres in the streets. Officials blame the protests on “infiltrators”. On Sunday, Sudan’s official news agency SUNA reported that authorities had arrested a “cell of saboteurs”, which had planned “acts of vandalism in the capital”. Amnesty International called for the immediate release of those arrested, and for the government to restore the internet and “respect the people’s right to information”. In his first public comments since the protests began, al-Bashir warned citizens on Monday against responding to “attempts to instil frustration”, according to SUNA, which also reported that the president and security aides had met. Bashir was quoted as saying the government was “continuing with economic reforms that provide citizens with a decent life”. 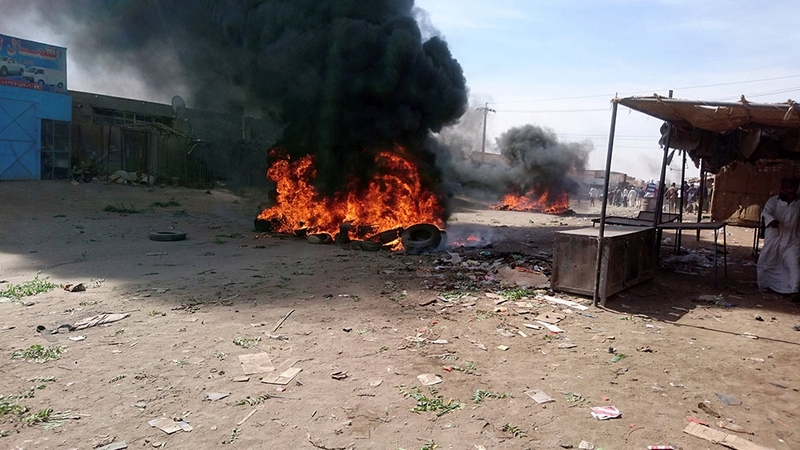 But anger has been boiling across Sudan, with some describing it as a “ticking time bomb”, over the rising costs and other economic hardships, including soaring inflation and limits on bank withdrawals. “There is no cash at the ATM machines most of the time. Banks keep sending people away with only 500 SDG [about $10.50 at the official exchange rate] in their pockets, which is barely enough for a day,” said 29-year-old Yusuf Elhag, who has been protesting in Khartoum. “Many had expected the lifting of US sanctions in October 2017 would invite foreign investment and bring about an improvement in the economy, but the opposite has happened, for multiple reasons,” said Isma’il Kushkush, an independent journalist who reported for eight years from Sudan and East Africa. According to Kushkush, the Sudanese people have become angry over the Central Bank’s decision to devalue the pound. Inflation also rose by nearly 70 percent, he said. But what started as an economic protest has now turned political, with many calling for the end to al-Bashir’s rule. “Protests that started against high bread price have become calls of ‘the people want to bring down the regime’,” Kushkush told Al Jazeera. During Abboud’s rule, Sudan’s economy suffered, leading to widespread discontent. On October 21, 1964, police stormed a meeting of Khartoum University’s Student Union whose members were discussing the political situation. Mass protests and strikes ensued in what became referred to as Sudan’s October Revolution. Abboud was forced out. In 1989, al-Bashir took power in a coup while the country was experiencing a civil war. The war officially ended in 2005, but other conflicts broke out, including in Darfur. The International Criminal Court has issued two arrest warrants for al-Bashir, accusing him of a number of war crimes, genocide and other grave human rights abuses allegedly committed in the country’s western region. 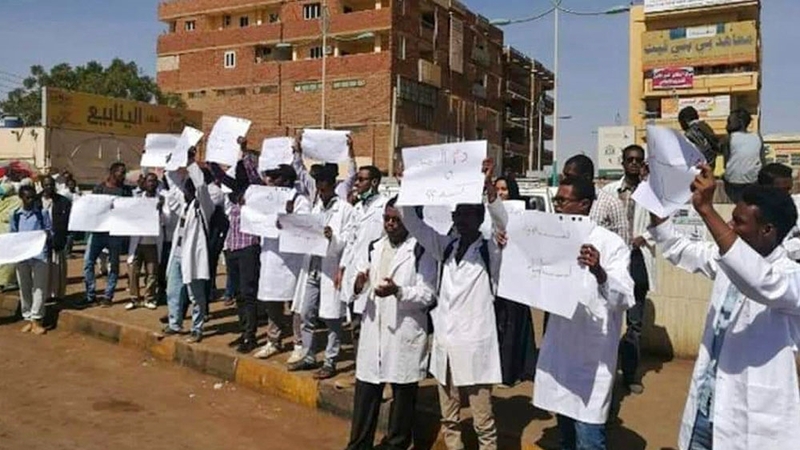 On Monday, doctors part of the independent Central Doctors’ Committed, which is affiliated with the independent Sudanese Professionals’ Association, began a nationwide strike. According to the Associated Press, the coalition said the doctors will continue to respond to emergencies during the strike. The coalition also said the work stoppage aims to “paralyse” the government, denying it much-needed revenue. According to AFP news agency, the ruling National Congress Party said it understands the protesters concerns, but a spokesman for the party also blamed the unrest on Israel and “left-wing parties that hope to destabilise the state”. On Sunday SUNA quoted a military statement that read, “The armed forces asserts that it stands behind its leadership and its keen interest in safeguarding the people’s achievements and the nation’s security, safety along with its blood, honour and assets”. The people of Sudan are simply “asking for a better lifestyle, better human rights and a better life,” Elhag added.